If you are looking for a silver lining to a cloudy British summer growing Wasabia Japonoica is it. Wasabi loves its summers cloudy and cool so if the weather is dull you can take solace in the fact the wasabi will be thriving. A well established plant will send large heart shaped leaves 60cm high and a meter wide, making a striking feature in a shady spot where other plants might struggle to gather enough light. These leaves will die back in winter as all the plants energy travels down into the rhizomes that will be forming at the base of the stems. These precious rhizomes are swollen stems, not roots, and they hold the vital goodness that will carry the plant through winter and see it re-grow with vigour the following spring. Wasabi will survive temperatures down to –5ºC, to protect it from those really cold nights some straw or fleece covering the crown of the plant is a good idea. Patience is a virtue with wasabi and the reward of harvesting and grating your own fresh wasabi paste will be all the sweeter for the two years it can take to yield the famously pungent rhizomes. Leaves and stems are edible and these can be picked in small numbers throughout spring and summer to spice up a salad whilst you wait for rhizomes to form. In March and April long stems holding a cluster of delicately scented white flowers will appear, these can be eaten raw or fried in tempura batter if you are out to impress. Several rhizomes weighing 100g and more will provide you with a bountiful and eye-watering harvest to share with friends over sushi or in any of the delicious and original recipes we have created with an English twist. We think we hold the British record at 377g for a single rhizome, if anyone can beat that we would prefer you keep it to yourself and not break our hearts! 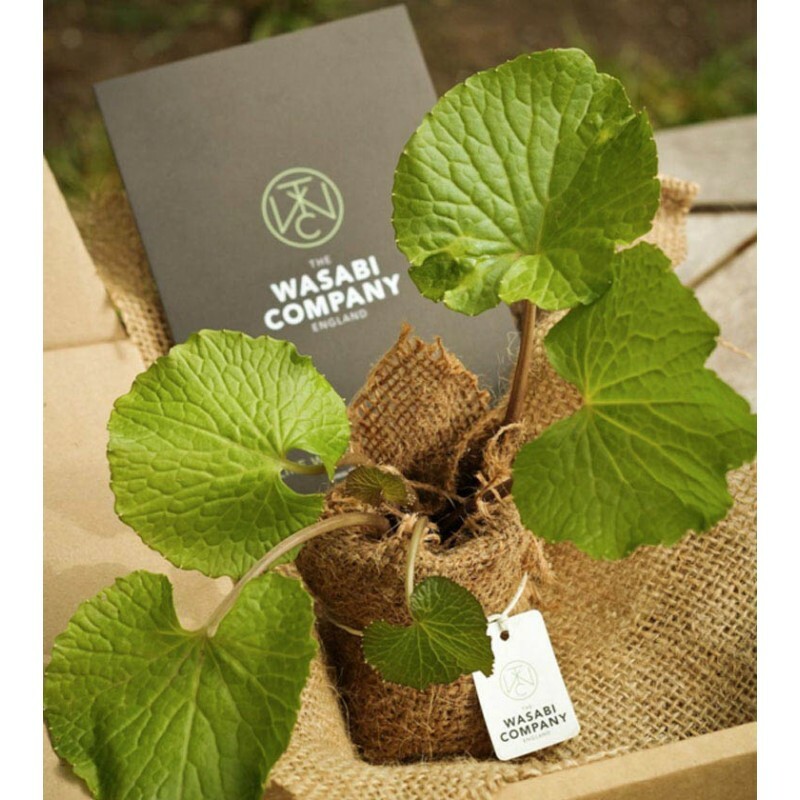 Upon receiving your wasabi plant we recommend you plant into a 9cm (3") pot with compost to help it establish a good root structure before planting out 4-5 weeks later. Growing in a container is possible provided the soil is kept moist and nutrition is provided with a top dressing of compost or a general purpose plant food, we suggest a 9 litre pot as minimum size. When planting outside the soil should be fertile and well draining as although wasabi likes plenty of water it will not like to be sat in a puddle for extended periods. If you have a pond wasabi will be happy on the edge provided shade is available. Plant so the crown of the plant is not covered but remains slightly above the soil so new leaves will emerge unhindered. Wasabi is accustomed to shady river banks high in the Japanese mountains so has evolved to survive in very low light levels. So much so this plant will need protecting from the summer sun with heavy shade. Under over-hanging branches, behind a tall bush or on the shaded side of a fence or wall are all good spots. 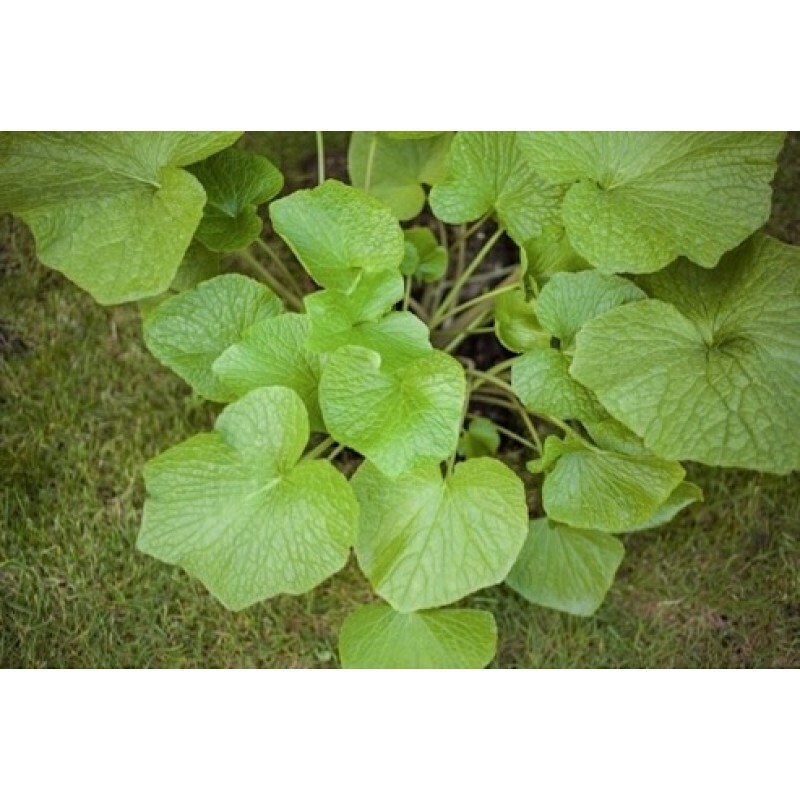 Once established wasabi is not unduly demanding and pests and disease are unlikely to be a problem in a healthy plant. The occasional aphid or some mild mildew may be seen but these are unlikely to threaten more than a few leaves. Keep the soil moist and feed with a top dressing of compost, manure or a general purpose plant food. If your shade is not sufficient in summer and you notice the leaves yellowing provide more shade by growing a tall plant on the sunny side or hanging a piece of shade cloth over the wasabi. Wasabi leaves will die back over an English winter but will re-grow if the crown is protected from hard frost with some straw or fleece. Harvest is possible after approximately two years when rhizomes should be clearly seen at the base of the stems. Pull the whole plant and break the rhizomes free from the rest of the plant. These can be cleaned of any remaining soil and grated for the freshest of fresh wasabi. Once harvested the rhizomes will store well in the fridge if kept moist either in a bowl of water or wrapped in damp cloth or tissue. Leaves and stems are edible and these can be picked in small numbers throughout spring and summer to spice up a salad whilst you wait for rhizomes to form. In March and April, long stems holding a cluster of delicately scented white flowers will appear. These can be eaten raw or fried in tempura batter if you are out to impress. Patience is a virtue with wasabi and the reward of harvesting and grating your own fresh wasabi paste will be all the sweeter for the two years it can take to yield the famously pungent rhizomes. Pull the whole plant and carefully separate the rhizomes that have formed at the base. Small buds or shoots that you will find grow from the base of the plant can be planted and used to grow your next crop of wasabi. Our website details how to store and prepare your harvested rhizomes. Choose a rhizome size to match your dinner plans. 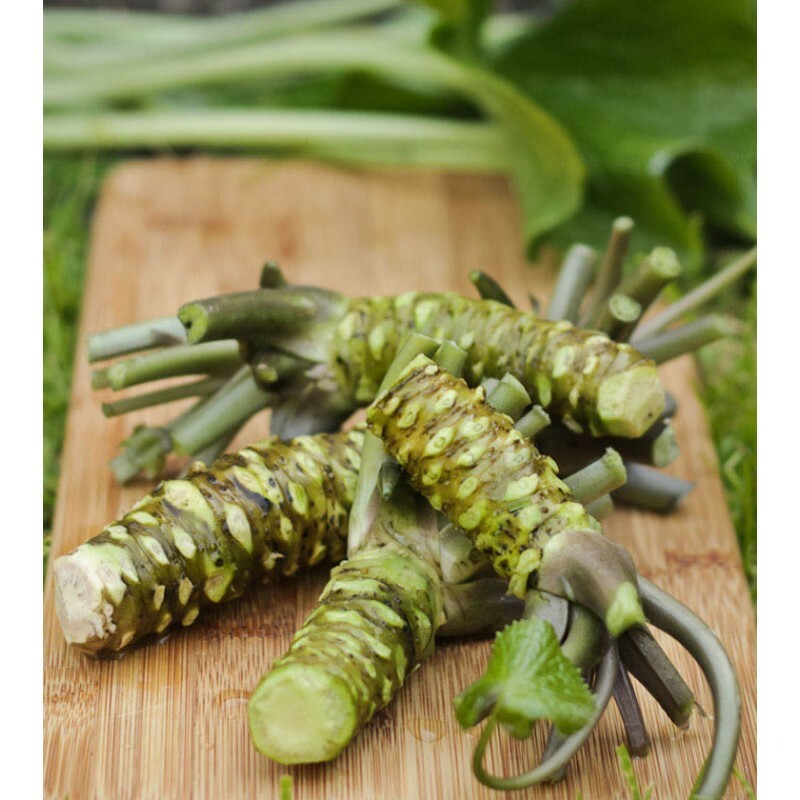 Our fresh wasabi is grown in natural, mineral rich..
Yubeshi – fermented yuzu fruit. Handmade by a very select few families who have the ..
Peeled black garlic, grown round the corner from us in Dorset. Black garlic is created whe.. Aimed at connoisseurs this is rich, full-bodied miso for soups, stocks, sauces, marinades and consom..